As a Christian, I should be about the business of glorifying God and loving Jesus Christ. If that seems like an abrupt turn from music, the reality for me is that I see God’s handiwork in everything, and frequently “hear” the Holy Spirit in secular songs (or, more to the point, take comfort in songs that remind me of scripture). Which brings me to “End of the Line.” This song always reminds me of man’s mortality, not least because one of the principal players involved, Roy Orbison, passed away just before it became a popular hit. Orbison, like me, was a Christian. He died at the age of 52 (I am 53 as of the writing of this). I’m certainly not making any parallel between our lives, which were very different. Yet the song reminds me of the scriptural warning that our days are shadows. In my daily reading of the bible, I’m going through the book of Job, and there’s a line about mortality in there that’s very appropriate: “For we are but of yesterday and know nothing / For our days on earth are a shadow” (Job 8:9 ESV). The lyrics in “End of the Line” echo that sentiment in the line “every day is judgment day,” although I suppose Matthew 24:36 is the more relevant quote in that case. Getting back to Orbison, many listeners may not realize that his life was not so dissimilar from Job’s. He was blessed with great success, but abruptly lost his wife (car accident) and two children (house fire), saw his success fade away, and had his success restored to even greater heights before being called home. As I said before, I see God’s handiwork in everything, and Orbison certainly saw his musical talent as a gift from God, so the idea of his music advancing the kingdom of God isn’t completely out of the blue. Lyrically, “End of the Line” doesn’t bear out a Christian message, but what I’ve always drawn from it is the notion that our ticket could be punched at any time. Returning to the province of plastic records, the flip side for this single is the album track, “Congratulations,” which is a Bob Dylan song in all but name. I’d rank it with some of Dylan’s better work from the period, which I realize is a back-handed compliment, but it’s still meant as a compliment. 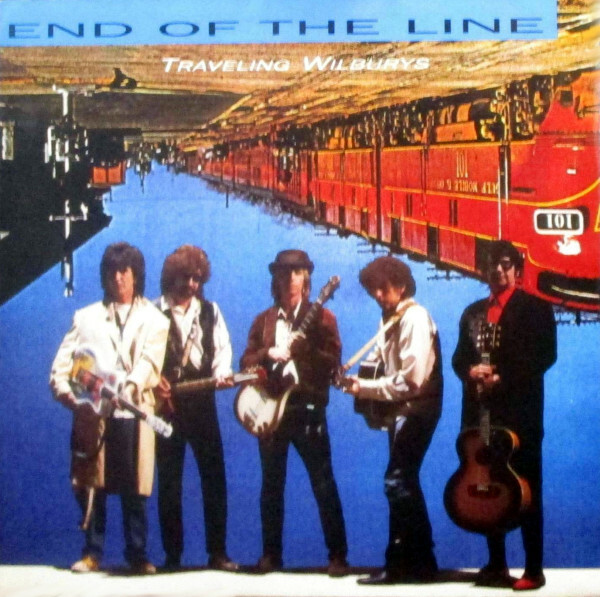 12-inch versions of the single featured an extended version of “End of the Line,” another bungled attempt to create a remix from the original Wilbury tracks that just ends up making the song longer without adding anything. Released on 7-inch, 12-inch single and cassette single on January 23, 1989 in the US and Australia (Wilbury, 7-27637/-4) and Canada (Wilbury, 92 76377) and on February 20, 1989 in the UK (Wilbury, W 7637/TW) with picture sleeve; reached #63 on the US charts (charted on February 11, 1989 for 9 weeks). Also released as one-track promotional CD single in 1988 in the US (Wilbury, PRO-CD-3364). Also released as one-track promotional 7-inch single in 1989 in Spain (Warner Bros., 1.036) with picture sleeve. 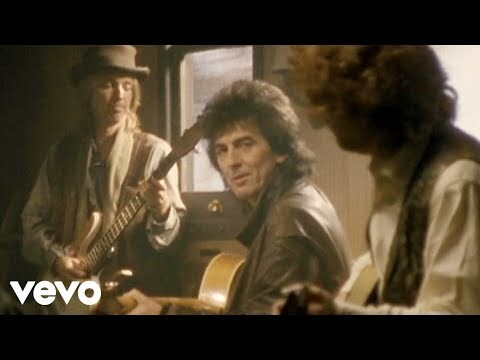 Re-released with “Handle With Care” on back-to-back hits 7-inch single in the US (Wilbury, 7-27732). “When I came to the phone, he said ‘Aren’t you glad it’s not you?’ And I said, yeah, yeah I am. He said, ‘He’ll be okay. He’ll be okay. He’s still around. Just listen, he’s still around.’” – Tom Petty, recalling his phone conversation with George Harrison after the death of Roy Orbison.